All rights reserved. No part of this publication may be reproduced, stored in a retrieval system, or transmitted in any form or by any means, electronic, mechanical, photocopying or otherwise, without the prior permission of the copyright owner. Applications for such permission, with a statement of the purpose and extent of the reproduction, should be addressed to the Director, Publications Division, Food and Agriculture Organization of the United Nations, Via delle Terme di Caracalla, 00100 Rome, Italy. Figure 40 Transfer of the sample taken with the swab on to the surface of the culture medium. Figure 41 Bacterial colonies grown from one cell each on the culture medium after the incubation period. Although the demand in developing countries for animal proteins is increasing, animal production has failed to keep pace with the growth in demand and to make full use of its potential in developing countries. The nutrition of resource-poor rural producers can be improved both directly by consumption of animal food products or indirectly by enabling the purchase of food with returns from animal product sales. The average per caput supply of meat in developing countries is very low. In 1979 and 1986 it amounted to 12.7 and 15.4 kg/caput/year respectively as compared to the developed countries with 74.3 and 77.9 kg/caput/ year respectively. The average per caput supply in developing countries in Africa reached the average level of all developing countries in 1979 with 12.9 kg/caput/ year but in 1986 remained at 11.8 kg/caput/year, below the level of the developing countries combined and even below the 1979 level. While efforts are increasing to support animal production in developing countries, they are not matched by similar efforts to use preservation to overcome seasonal variation in meat supply. In addition the existing conditions for slaughtering and meat handling in rural areas which cause quality deterioration and post-harvest losses of meat- and food-borne diseases in consumers must be improved. In fact there is a lack of effort to provide knowledge and skills in adequate hygienic slaughtering, meat cutting and handling under rural conditions. Taking into account that an uninterrupted cold chain for meat cannot be expected in many developing countries in the near future, the absence of meat preservation techniques presents a serious constraint to the development of viable meat production by resource-poor rural livestock producers. Adequate meat preservation complements a marketing system which by necessity has been adapted to a fast throughput of fresh meat and which does not facilitate the use of surplus meat in periods of meat shortage. While this publication is mainly intended to disseminate information on traditional methods of meat preservation in Africa for teachers and instructors, it also addresses aspects of hygienic slaughtering under rural conditions. 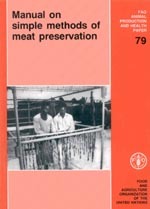 Reference is also made to FAO's work on small-scale slaughterhouses, raw materials for preserved meat, principles of meat preservation by thermal treatment, packaging methods and basic methods of quality control.